As an HR leader, it is imperative to build the right technical and functional skills in Analytics to spearhead your organization and enhance your career. 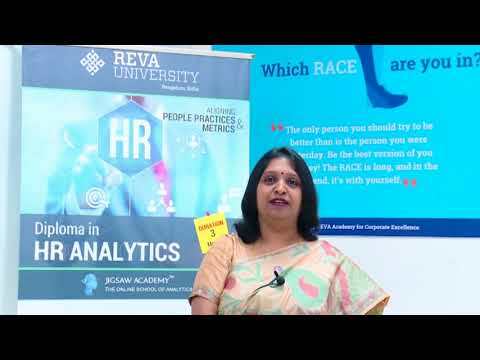 REVA University in association with Jigsaw Academy offers a three-month weekend diploma in HR Analytics program in Bangalore to empower leaders like you. 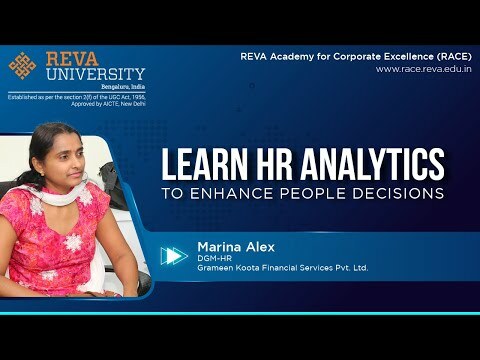 REVA’s diploma in HR analytics in Bangalore is one of a kind program, integrating powerful tools, analytics framework, case studies and real time data sets to change the HR landscape of your organization. This three month weekend program is designed to help fast rising HR professionals to improve their data driven decision making skills. The program intend to provide in-depth knowledge and hands-on skills on best practices, metrics, processes, tools in HR Analytics domain to improve personal decision making capabilities and overall business performance. The course offers professional guidance on resume building, interview preparation and identiﬁcation of apposite opportunities. Why Pursue Diploma in HR Analytics? HR as a function has moved on from being a cost head to a strategic partner contributing to the bottom line profitability of organizations. HR leaders now focus on understanding how organizations can enhance their human capital by leveraging data pertaining to employees. This could range from talent identification, improving new hire quality, identifying and developing potential leaders, predicting turnover of employees, capturing the workforce demographics and dynamics, objective assessments and much more. Applied properly, HR analytics can show connections, correlations and even causality between HR metrics and other business measures – all of which can be used to design effective HR strategies. In other words, HR analytics can provide a tangible link between people strategy and the organization’s performance.